In this hilarious graphic novel, Edison Beaker is about to find out what services the family business, Creature Seekers Pest Control, really offer. (Hint: forget about rat and roach removal . . . think monster hunting!) Edison Beaker and his young sister Tesla are staying with their uncle Earl, manager of the family pest control company, when an alarm sounds and he has no choice but to drag them along on a service call. They should have listened when he warned them, "stay in the van." Monster-sized mayhem ensues when the kids chase their escaped hamster into a mysterious warehouse--and suddenly they are the ones being chased as all sorts of creepy creatures scurry, slink, and stomp through a secret Night Door. The first of two new middle-school graphic novels that introduce a funny, smart, likable, reluctant hero and his wisecracking younger sister, whose adventures are sure to appeal to readers of Lunch Lady, Hilo, and Caveboy Dave. "Frank Cammuso is a masterful cartoonist and Edison Beaker is an absolute delight." former National Ambassador for Young People's Literature, Printz-Award winning creator of American Born Chinese, and New York Times bestselling author of Secret Coders "I love Frank Cammuso's comics! Great characters, snappy dialogue, and always something awesome going on!" 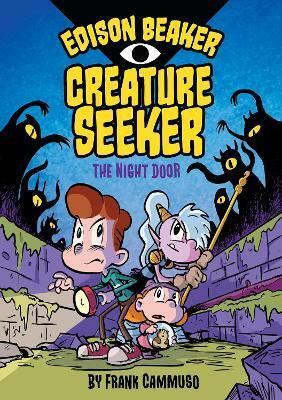 "Frank's seemingly effortless cartoon touch, characters, and sense of humor make this charming, chase-filled, slapstick, modern fantasy adventure that feels like Calvin and Hobbes meets Monster Squad, a delight to read! Five rolling hamsters out of five!" Frank Cammuso is an Eisner-nominated author-artist and the creator of The Knights of the Lunch Table and The Misadventures of Salem Hyde graphic novel series, among other books. He is a former award-winning political cartoonist for The Post-Standard newspaper in Syracuse. His cartoons have been reprinted in The New York Times, The Washington Post, USA Today, and Newsweek. He teaches illustration at Syracuse University.